LaseMD is a laser skin resurfacing treatment that can stimulate the body’s natural collagen and elastin production to provide healthier, younger-looking skin. This is achieved through non-ablative laser energy, which gently heats targeted tissue in the deeper layers of the skin while leaving the surface layer intact, typically resulting in little to no downtime when compared to the full ablative lasers of the past. LaseMD is effective for ALL skin types and is tailored to the severity of one’s skin concerns. Patients can resume normal activities immediately for a simple, yet powerful, way to repair sun-damaged skin, reduce fine lines and renew a dull or uneven complexion. Makes it easier for medical grade skincare products to penetrate into the deeper layers of the skin and help build collagen, which gives skin its youthful appearance. A LaseMD treatment works with your body’s natural healing process to stimulate skin cells. The laser creates micro-wounds that trigger the body to fill them with new collagen and elastin and causes the damaged skin to gradually flake off in the days after your treatment. You will notice with just one treatment improved skin texture, firmness, hydration and a brightened complexion. While LaseMD causes minimal discomfort, your treatment can begin with numbing cream if you prefer. The procedure is quick, typically lasting 20 minutes depending on the treatment area and the extensiveness of the session. 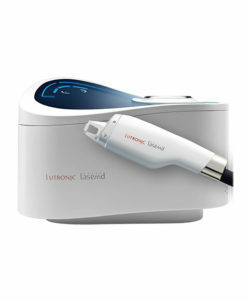 After the laser treatment is finished, we can further enhance your results by applying a unique serum specifically designed to complement LaseMD and your specific concerns. You may see some flaking in the days after your treatment when your skin gently exfoliates and will begin to see results within 1-6 days after your treatment. The number of sessions you’ll need will depend on your specific goals and your skin’s current condition.